At Lakeside Theatre we recognise that the local area is bursting with creative people. Through our associate artist relationships we hope to offer a useful space to develop, explore and create. This might take the form of rehearsal space, work space, creative residencies, technical resources or just a supportive ear to talk through an idea. Associate artists are also on hand to mentor students and instigate creative conversations in and around the building. Packing Shed is a Colchester-based theatre company established in 2014 which aims to showcase local talent. The company started life on a shingle island off the Essex coat with a children’s sequel to The Tempest that could only be accessed by boat. 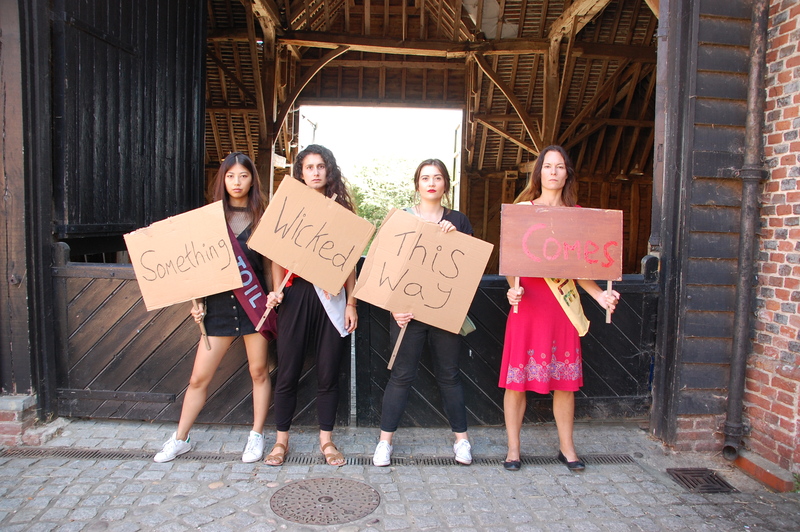 Exploring notions of place, from the salt marshes of Essex to the wide open skies of Suffolk, the company’s productions have been either site-specific or in theatres. As well as finding untold stories from the East of England, the company is dedicated to developing new talent in the region: actors, directors, designers, writers and composers. In Search of England and Memento Mori at the Mercury Theatre ; Colchester and A Midsummer Night’s Scream and All Hail Macbeth in the gardens of Tymperleys Clock Museum. HOW ARE THEY WORKING WITH US? Packing Shed will work with the Lakeside Theatre on the development phase of a project for 2019, The Robbers, based on the play by Friederich Schiller. University of Essex students and alumni will come together with professional theatre practitioners to explore through improvisation the notions of kinship and personal freedom which arise in the play, where characters wrestle with the tension between the true liberty they seek and the social commitment to their peers. This project will culminate in a full production at a secret location later in the year with a cast of professional actors, as well as a community troupe of actors, singers and musicians. Jean Abreu (Choreographer/Performer). Born in Brazil, Jean choreographed his first work in 2003 and later that year was honoured with the Jerwood Choreography Award. Since then, his work has toured throughout the UK, Europe and Brazil including performances for London Dance Umbrella and the Southbank Centre. Playwright Nicola Werenovska’s work has been short-listed for several national playwriting competitions including the Drama Association of Wales Playwriting Competition (2005), the London Writers Competition (2005), Channel 4 The Play’s the Thing (2005), the Churchill Theatre Playwriting Competition (2006), the Soho Verity Bargate Award (2007). 2015. Her latest play Silence is touring regionally in 2018. Richard is a playwright, audio producer and dramaturg having trained at The Royal Central School of Speech and Drama. His literary work includes Script Reader (Mercury Theatre), Literary Co-ordinator (Frequency Theatre) and Dramaturg (Home From Home, Lakeside Theatre). Richard has judged short play competitions for The Essex Dionysia (Lakeside Theatre) and Making Waves (The Essex Book Festival).